More of my white work for the class with Karen Ruane. Look at what was in my mailbox today!! She had said on her blog that this little charmer was heading to a friend, but she didn't say who. Imagine my excitement when I opened the mail box and found a suspiciously smushy envie today with her return address. Could it be that *I* might be the lucky friend?? I am, I am!! This picture does not even begin to do justice to the lovely little details Pam has included, but perhaps if you embiggen it you will be able to see it better. Pam, my friend, this was a total surprise and SUCH a delight. Thank you so much!! 1. Pat Winter has some free labels for our ORT jars available on her blog. Thanks Pat! 2. The latest issue of CQMag is up and, as always, it's a good one. Go HERE. 3. Mr. Finch, whose work I very much admire, has created some wonderful barn owls. You have to go and see them HERE. Here is a close up of a section I've been working on the past couple of days. I cross stitched the word 'Family' using three shades of DMC floss and rather like the way it looks. The flower below that is one I crocheted and then added an antique button in the centre. (You can click on the picture to embiggen it). Today the mailman brought me something all the way from Australia! Kaite has been doing some shadow knitting and I commented about how intriguing it was and she sent me a lovely pot holder she made using the technique. I've taken a couple of pictures that will hopefully give you an idea of what it looks like. Can you see how the pattern really shows as you change the angle? Yep, there's a lot of truth to that particular post title, especially today! However, in this case I'm referring to the fact that today is the date we post a photo of our ORT* jar for the TUSAL**. to give you some idea of scale. ** TUSAL is the 'Totally-Useless-Stitch-Along'. Here's Mr. Woodpecker enjoying his breakfast. Or is it mid-morning snack? I couldn't believe he just stayed there while I opened the balcony door and stepped outside to take several pictures. We have at least one pair of these little fellows devouring the suet (and creating lots of racket). Fortunately our next door neighbours love them! Today I didn't end up with much in the way of stitching time, but I did manage to add a few things to this block. The word 'joy' in cross stitch (Joy is what I feel when I'm stitching! ); some laced running stitch (upper middle); the buttons on top of the prairie points; and the little cross stitch motifs beside the round doily on the right. Have I mentioned how much fun I'm having? Thanks Karen....you rock!! For your viewing pleasure (and possible help with your organization) have a peek at this post that Karen (another Karen!) from Sew Many Ways has done... HERE. Further for your viewing (and drooling) pleasure, please go and visit Suzy HERE. I know I've sent you there before but trust me you really need to go again (and again). Be sure to scroll down! This one is for the knitters - Garn Studio has put up their latest Drops collection for spring HERE. If I could knit like the wind there are a few items here I would certainly love to have. Please be sure to scroll down to see them all. Never mind, you don't have to answer that! Is it possible to have too much fun??? Today I began stitching on one of my white blocks. Could that be because I was having fun?? and puffs to add dimension. Above you can see that I've added one of the lace flowers (leftover from the trim you can see in the last picture). There was only one flower and it fit here perfectly. The lace on the right of this photo is a piece of handknit that my grandmother did - originally used as trim on pillowcases. I added some fly stitches and french knots. Gosh, it's hard to come up with new titles that have to do with 'white' without repeating myself! I've discovered two things you might be interested in (because I am, you should be too!!). Go see, and tell me you don't want them too!! 'The Art of Annemieke Mein'?? get thy hands on a copy!! Oh yeah, I covet that too!! Finally, I get to the white part of this post....more of the blocks I've pieced for the Embroider, Embellish, Create class currently being taught by Karen. Have I mentioned that this just might prove to be additctive?? a piece of a tea towel. a pre-embroidered piece from a thrifted blouse. a piece of dupioni silk. oh yeah, and it snowed today. ....and it's not snow either....but that's supposed to be on the way in the next day or two. Today I actually got to stay home all day (other than for going for a walk) and I was able to make eight blocks for the Embroider, Embellish, Create class. Yippee for me!! Not only am I making blocks to stitch on but I'm reducing my stash at the same time. Win/Win I would say! Above is the first block. Karen taught us how to make prairie points - so elegant and so easy to do. This block has an already embroidered piece which came from a small tablecloth (probably card table size) that my maternal grandmother embroidered in the late 50's or early 60's. There's a small piece of dupioni silk, which I'll be using a lot in this (it's my favourite fabric). There's also a piece of a hankie and a piece from a table runner I had stashed away. Over the next few days I'll show a few of the other blocks I've created. Now I can start to embroider -all in white, so I'd better not be drinking my coffee anywhere near my work!! That's going to be HARD!!! Today is the long-awaited beginning of the 'Embroider, Stitch, Create' online class under the capable direction of Karen Ruane (who has been long admired on this front). I'm SO excited about this class and have been counting the days until it begins. This morning the first lesson was posted and I had a grand time learning to make rouleau loops - something I have never attempted because I was totally intimidated by having to turn those little tubes of fabric right side out. Karen has a way that is so simple and now I know I'll be making lots of these. I thought I wouldn't have anything to mumble about until at least Friday but tonight I came across a fun idea that I really like and thought I should pass it on to my loyal followers. 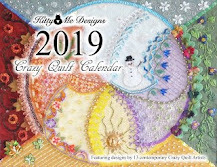 The idea is this: there are 366 days in 2012 (it's a leap year) and the person that writes the Garden of Daisies blog has made the suggestion that we could declutter all year by simply getting rid of one thing each day. That would be three hundred and sixty six items that would no longer be cluttering your home. Go HERE to read more about it!! Yep, I'm admitting to it publicly! I spent part of a day on the weekend mucking through my stash looking for gold. Nope, didn't find anything valuable (darn it!!). 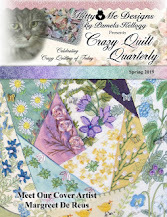 All of which is 'fodder' for the 'Fool's Gold Crazy Quilt Round Robin' I've signed up to do starting the beginning of February. Gerry Krueger is the 'mama' of the group and you can find more information HERE. in the 2012 TAST challenge. Go HERE to see it! !